There you have it. Cabbage has a bad reputation. My mother insists the foul odour so memorable in the cooked cabbage of her youth has been weaned right out of modern cabbage offerings. She might be right. I don’t find the smell of cooked cabbage lingers either. That said, I do recall the mother of a long ago boyfriend insisting cabbage (and by extension, Brussels sprouts) needed to be cooked for a good hour. Those good old days were the bad old days of vegetable cookery. For more than a millennium, cabbage was common fare on the Mediterranean table. 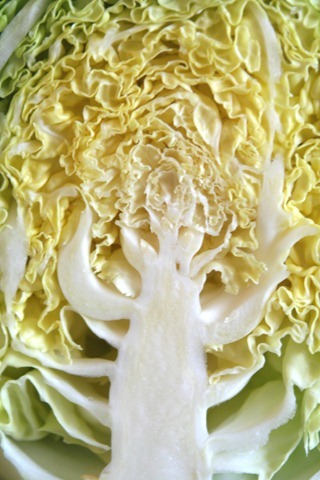 Kale, Brussels sprouts, cauliflower, broccoli and kohlrabi are all forms of cabbage. The Romans had a love of cabbage because they believed it had some medicinal value. They believed eating cabbage could cure a hangover. Perhaps if this little known fact were exploited, cabbage could become extremely popular. Or in coleslaw it’s certainly nice. Every time that I dine. When there’s cabbage, I fill my plate twice. If you enjoy braised cabbage you will enjoy this unusual dish made with cabbage, apple, caraway seeds and layered with phyllo pastry. 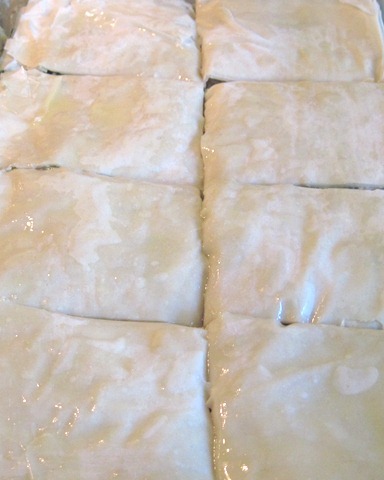 Many phyllo recipes use mountains of butter. I usually find the quantities given are way to much. Enough needs to be used to give a flaky dough. Years ago, I watched phyllo pastry being made in a Greek pastry shop in London, England. When the time came to use the phyllo, the pastry chef picked up a 4 inch paint brush, loaded it with melted butter and used his brush in the same “drip” manner as Jackson Pollock, the abstract expressionist. If you run out of butter, you can always melt some more. 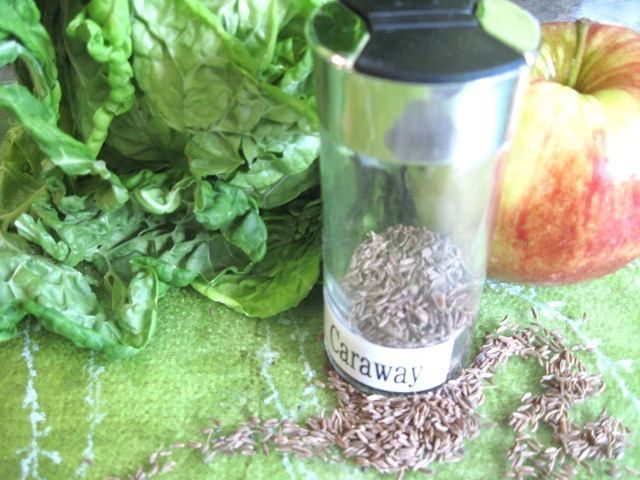 Caraway seed has a spicy licorice flavour that gives rye bread its distinctive taste. The seeds are used in soups, cheeses, cheese spreads, sauerkraut and salad dressings. Liqueurs, such as Kummel and some schnapps, use caraway seed for their unique flavour. The seed (and teas made from the seed) soothe the digestive tract. Its carminative or gas relieving action relieves bloating caused by wind. It just might be that caraway and cabbage are a match made in culinary heaven. One produces gas; the other relieves gas. 1. In a large skillet, melt 1/4 cup butter. Add onion and sauté over medium heat for 10 minutes. 2. Add cabbage and cook for 5 minutes. 3. Add vinegar, apple, salt and pepper. Cover and continue cooking for 10 minutes or until cabbage is soft. The cooking time will depend on the type of cabbage used. 4. Cool. Taste and adjust seasoning. 5. 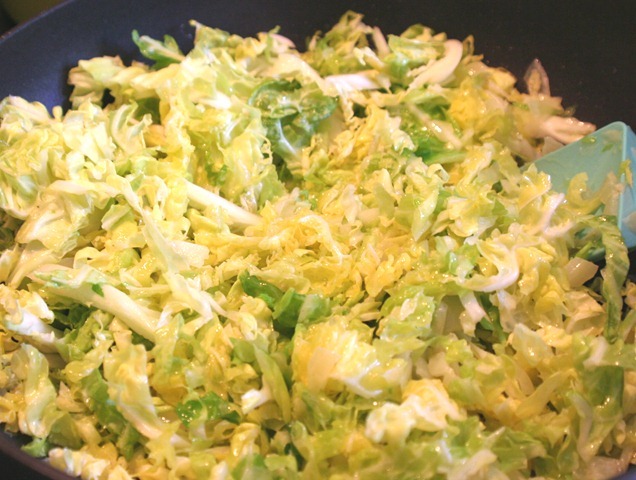 Combine cabbage mixture with 1/4 cup of the bread crumbs, caraway seed, eggs and cheese. 6. Preheat oven to 375F. Butter an 11 by 13 x 2 inch oven proof dish. Melt remaining 1/2 cup butter. 7. The back of the phyllo box has good instructions for handling phyllo pastry. Set out the phyllo sheets. I cut the phyllo in half to fit my baking dish. You can, of course, make this in a jelly roll pan accommodating the entire sheet if you prefer. 8. Lay one sheet of phyllo on the oven proof dish. Brush lightly with melted butter. Repeat with four more leaves of phyllo dough brushing each layer lightly with melted butter. Spread cabbage mixture over last layer. Layer remaining phyllo leaves on top of cabbage, brushing each layer with butter and sprinkling remaining bread crumbs between each layer. 9. Cut tourte into 8 equal pieces prior to baking. Bake for thirty minutes or until golden brown. Cool for 10 minutes before serving. This is good hot but it is equally good eaten cold…say, at a picnic. Now, imagine a golden brown and toasty tourte. We dug in before realizing I had not taken a photo of the finished product. Rest assured it looked lovely and tasted great. What you accomplish with the recipes I share with you is what makes me eager to share more. Thank you for following!